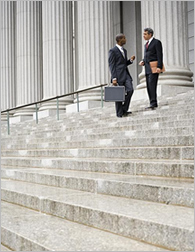 Attorneys know that the legal profession presents many unique challenges. This is certainly the case in the area of legal marketing where attorneys must advertise in a highly competitive market under a number of professional and ethical constraints. Indeed, stories abound of marketing consultants who led their attorney clients into trouble by not knowing the rules of their profession. Raising the Bar Media distinguishes itself from the many consultants in the field by knowing the legal profession from the inside. Among our most valuable team members are more than a dozen practicing attorneys and Juris Doctors who help us produce marketing materials that communicate with potential clients on a high level while being mindful of the ethical concerns attorneys face. Our experienced team has written more than 60,000 pages of optimized content for LexisNexis, Bloomberg BNA, and hundreds of law firms throughout the United States. Our contributors are well apprised of the latest legal developments and provide content that is topical, accurate, and engaging to readers. Our legal marketing content is jurisdiction-specific and can be tailored for any type of law firm, including those in niche areas of practice. Whether your firm wants to undertake an aggressive multi-front marketing campaign or simply maintain an Internet and social media presence, we can provide cost-efficient solutions made for lawyers by lawyers to meet your unique needs. Raising the Bar Media provides effective legal marketing solutions to law firms of every size and area of practice across the United States. Whether you are just beginning to consider expanding your market outreach or you already have a detailed marketing plan in mind, our team at Raising the Bar Media can help you develop and implement those ideas and turn them into new clients. Contact us today.